From the finished store inventory, the products are taken to the Central Distribution Cell (CDC) in Dhaka for extensive distribution across the country. The whole distribution for Dhaka is held from CDC itself. In accordance with the requirements, CDC distributes products to the "Regional Distribution Cell (RDC)" situated in Chittagong, Bogra, Sylhet, Rangpur, Rajshahi, Mymensingh, Comilla, Chawmohoni, Faridpur, Khulna, Jhenaidah and Barisal. RDC distributes the products to the respective urban and other remote markets by the company- owned distribution vehicles. 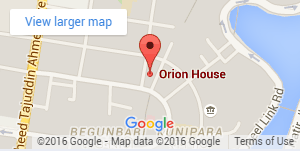 10, Hori Kishore Roy Road, Mymensingh. Word # 03 wapda Road, Moulvibazar. 135, Housing Estate, Amberkhana, Sylhet. "Care Building" Than Thania, Bogra. Sofder Ali Colony, CDA Avenue, Chittagong. 95, Gagon Babu Road, Khulna.